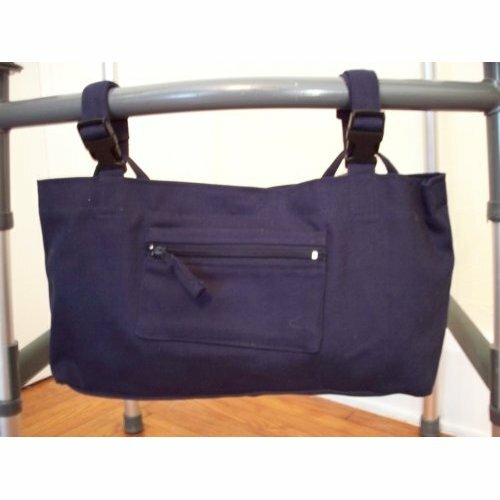 The Granny Jo Wheelchair, Walker, or Scooter Bag has adjustable length straps that are secured with clip fasteners, that allow the bag to easily attach to different mobility aids. The bag features an outside pocket with zippered compartment for a cell phone, and interior slots for credit cards and ID. 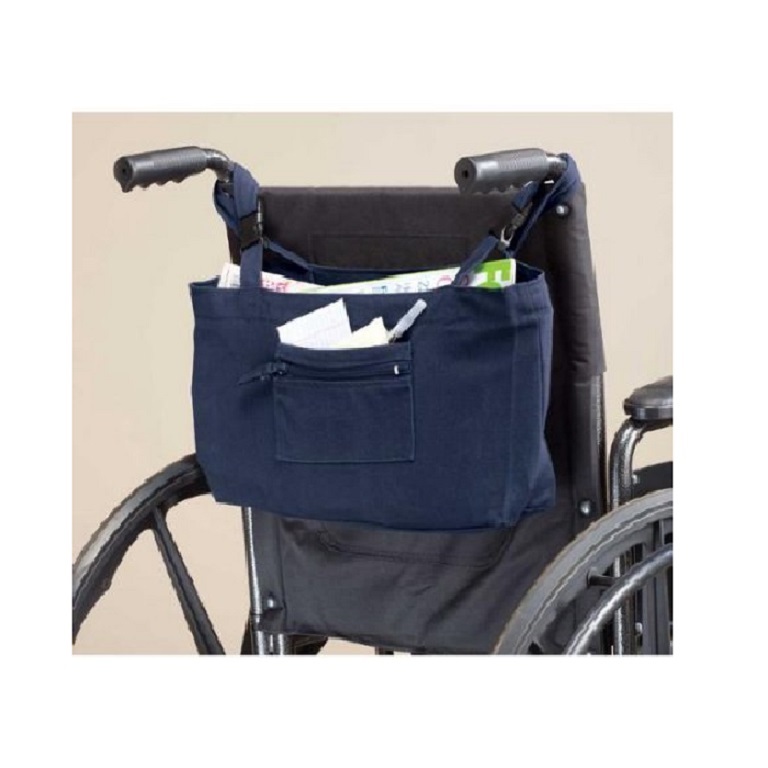 The Granny Jo Wheelchair, Walker, or Scooter Bag is made of 100% cotton duck fabric and measures 16 by 9 inches. 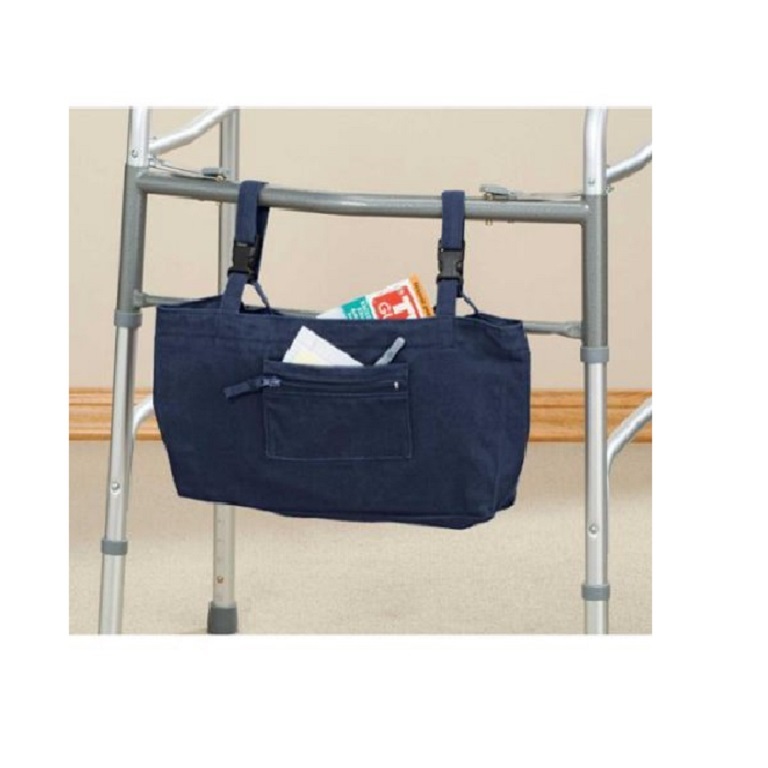 The adjustable length straps with quick release clip fasteners allow mobility aid users to easily attach and remove the bag as needed. 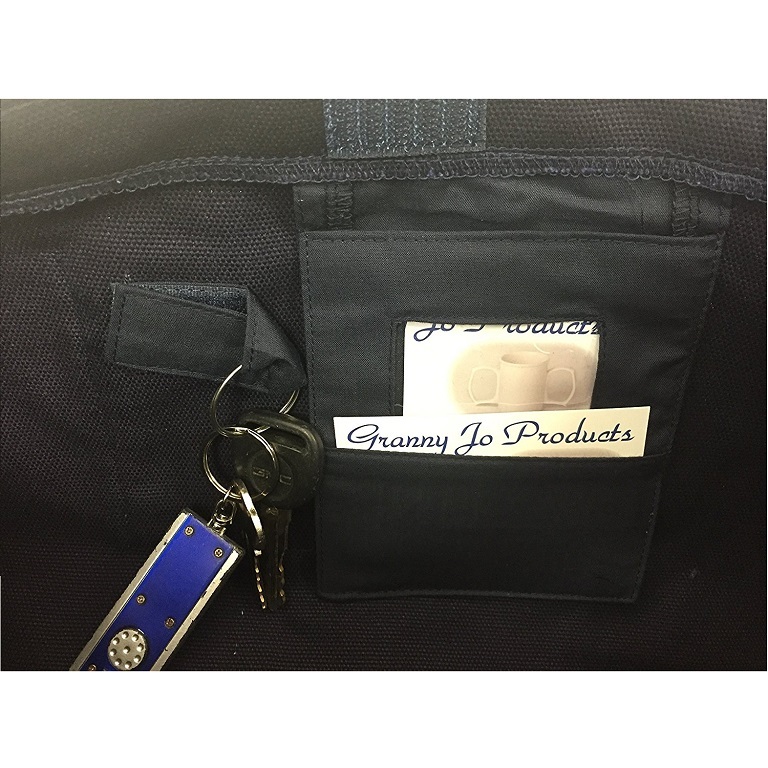 The interior pocket of the bag has a key ring holder and slots for credit cards or identification cards. The outside has a pocket with a zippered compartment ideal for holding a cell phone. 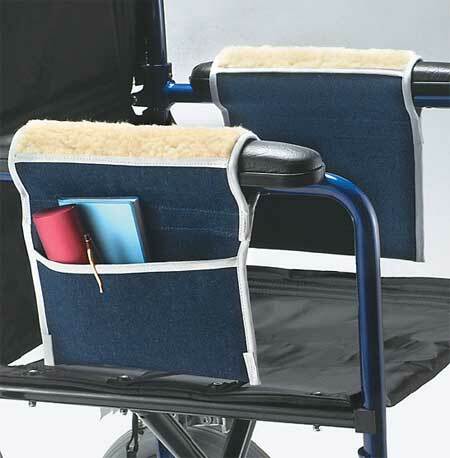 For wheelchair users, the bag can be attached to the inside or outside of the chair's arm depending on the wheel configuration or hung on the back of the chair. Scooter users can adjust the straps to fit the width of the arm on their machine. Attaches: Using adjustable straps and clip fasteners. Construction: 100% cotton duck with Velcro closure. Measures: 16 x 9 inches. bag nice and roomy; I switch from my walker to my Hoveround and also onto the arms of my scooter. 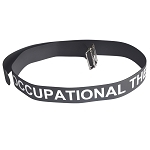 Love it; that I can have everything I need for my day without thinking of switch piece of equiptment my needs are attached. All in bag and I just move bag ; instead of what I need to several bags. Good buy; and multi purposed. 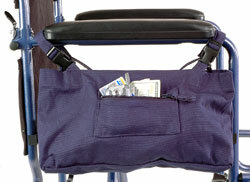 The bag is designed well, fits over the arm of the wheelchair, easy to install, convenient pockets. The problem is that the material is a cloth fabric which is not very sturdy. 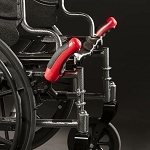 Wheelchair riders often scrape against the sides of doorways, and it didn''t take more than a few days for the fabric to develop a tear on the outer pocket, making that pocket pretty much useless. I might be able to patch it, but I suspect the patch won''t last too long either. There are other bags on the market that are made of sturdier materials -- they cost more, but it''s probably worth the extra expense. Disappointed in this bag. Too big and hangs too low for my Price Elete wheelchair. If the size is not a problem for you, it is a good bag. A: Measures: 16 x 9 inches. Q: I just ordered a bag and now I'm sorry that I couldn't see if it cam in other colors. My invoice # is: 9362. Does it come in other colors? Thank you. 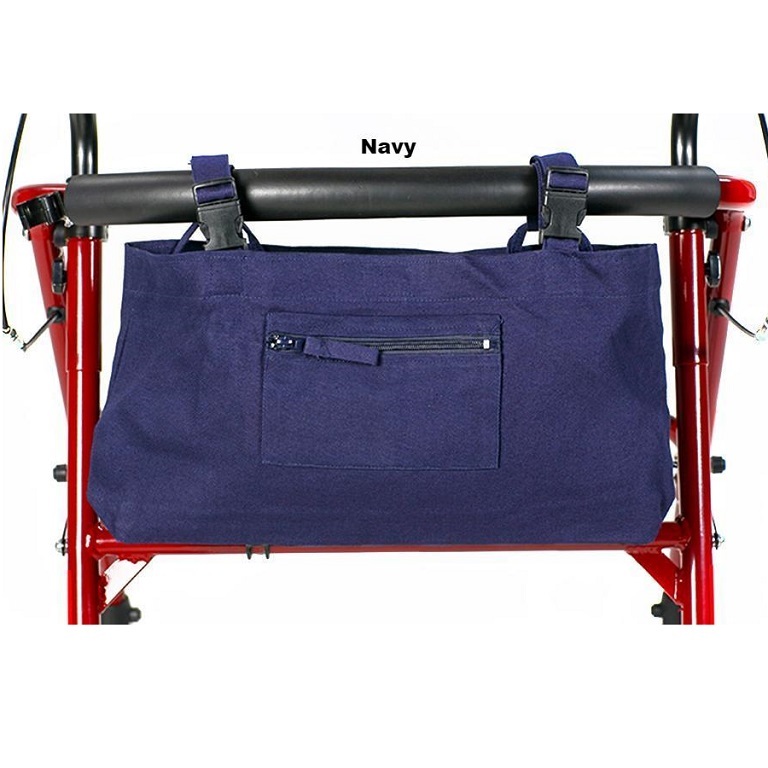 A: The Granny Jo Wheelchair, Walker or Scooter Bag only comes in one color that is shown on our website. Q: Where can I go to buy this product in Richmond va? Q: Do you have any bags that will not get caught and ripped apart by the wheels of a motorized chair?I bought one for my Sister. She loved it. 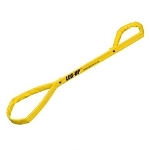 She only has use of her right arm and hand and could keep things she needed quite handy. Somehow it must have worked it's way down or back, and she caught it up in the wheel. All ripped and straps pulled off. Can't find another at a reasonable price, as she only gets $40 a month from the Nursing Home from all her income. A: We have several Armrest bags. It depends on the length from the armrest to the top of the wheel. 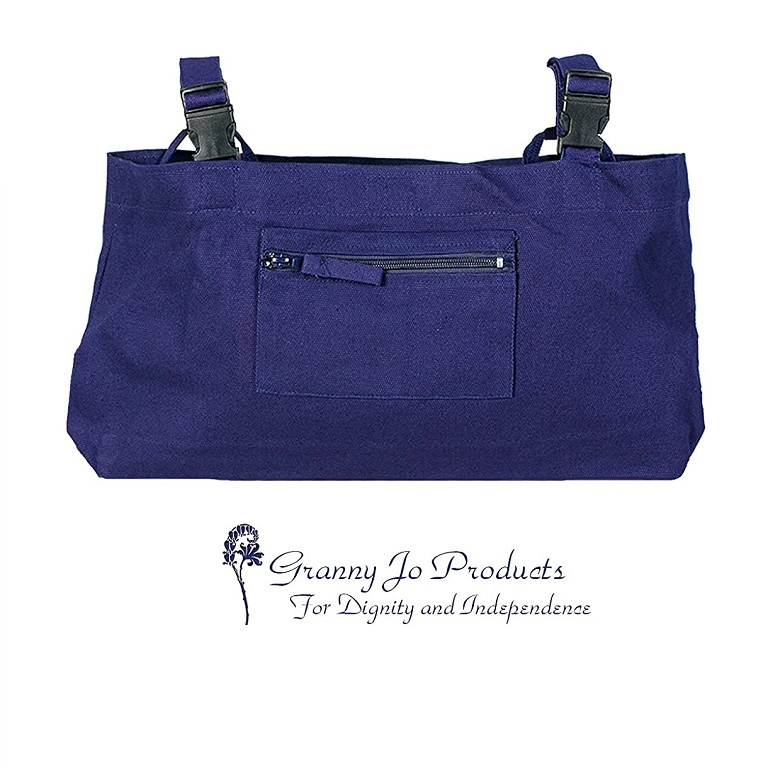 The Granny Jo Wheelchair, Walker or Scooter Bag is 16 x 9 inches.